How to Solve a Rubik's Cube - Pictures for Beginners! Picture-based Rubik's Cube solution guide for beginners. 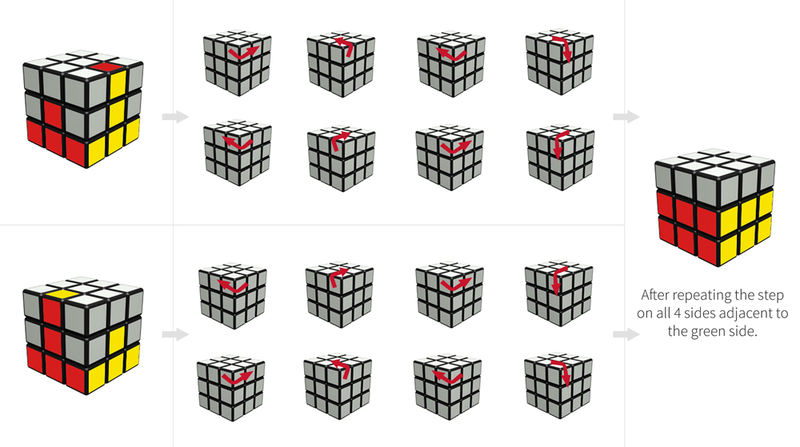 Rubik's Cube solution for the more advanced solver. Watch impressive Rubik's Cube world record videos. Fun and interesting Rubik's Cube videos. Read Rubik's Cube aricles, reviews, tips, news, interviews, and more. Doesn’t a cube have 6 sides? does the cube have to be set that way in the first picture? I dont understand what is it that Im suppose to be repeating? How does this work? I’ve tried doing the first step about ten times and it’s not working. I cant seem to get the hang of this. I keep getting one side done, but i lose it when i try to do another side. I can’t seem to be able to make the T shape. Any ideas? I’ve done this quite a few times now. Am I missing something or doing it wrong? Or do I just keep trying this step until my cube looks like the picture? For the 3rd example (the one that says green under), why wouldn’t one just turn the face surrounding the red center piece twice? Hello to everyone here. You all have good questions and I will try to answer them. 1. You don’t have to start this way, but its the easiest way to do it so… rule 1 remember that green has to be on top. 2.the side panel (on the right) will be the color your working with, and I figured out a better result, (the panel on the left) I fount that if you do the opposite you get the cross like pattern ex. look at the top diagram on the left, instead of having the green showing with the respective color underneath have the respective color showing with green underneath so your cubes starting position should be green on top, respective color right panel, respective color with green underneath. NOW turn the cube as instructed and look closely. You will have it guaranteed. It will look like the last diagram on the left ex. green, random color, random color, respective color, matching square with green underneath. Now turn the font panel 180 degrees until the green underneath is connected with the green on top. You’ll have the first part of that after picture now repeat all of this for orange white and yellow. I hoped this helped you guys out. My name is Paul – leave a note for me if this helped. I would love to help again. Thank you. I don’t get how I’m supposed to get from the top before picture to the middle before picture? This is awesome! I get it now, the Before on the left is the pattern you start with and then you follow the steps to the right to get a piece of the cross. Then continue on the other three sides to the left or right of the right side on the diagrahm. I used the first one twice then the second one once and the third one once. How many times do you spin it to get the right picture? The first step third row never works out for me. I always get one red on top and two greens on the right side. Help? My cube has green on top and yellow on the bottom. Have I a chance? No luck so far. @Mister X: Thank you so much that helped alot! When I start following given steps, does my cube need to be exactly look like how its displayed in upper left corner of the image with “Before” tag? Or just having a green in center of top side is enough? what do you mean repeat this step for all four sides?What about the other 2? ok so the 4 colors are green orange white and yellow?? Wouldn’t it be easier on the last possibility to rotate the right face twice? with me, the simple red and green are not where they are supposed to be in the pictures. i dont get how you make the red/green cuboid in place. What if only 2 of the side arms line up correctly? Ok, I understand the steps, but my cube isnt set up to look like that. So how do I get it to look like that in the first place?? I got the green cross, two whites and two oranges on two sides. What do I do next? This is to Paul: does this mean that when you start on the first ‘before’ picture…you do the steps and then it becomes the second ‘before’ picture and then the third? what happens next? Which four sides am i suppose to repeat? I can’t get the cross. There is not a green square in any of those positions for a side! I’m so confused, what is the respective color? And does the green middle have to be on top an the red middle be on the right? I don’t get what it means for “red under” when it’s on the right? I have a problem with the first step: after completing the third line of the first step I’m not getting the “AFTER” ones solution sshown in the AFTER column. How do I do this? :Green top center,red right center,green front bottom middle,red under bottom green. How many times do I repeat? Very vague on how to do this first part… You should let everyone know that you must start with the blue side (then orange, green, red) and re-orientate it accordingly. After i do the first 3 moves its meant to be green, red, green and then red like in he top left photo, but mine turns out to be green, green, red and red every time. Why is this? I am a beginner. How do I get the cube like the very first picture? But i still don’t get how you get those yellow and red pieces there? it isn’t explained here.. I don’t understand what it means by “after repearing this step for all four sides”. Which sides is it referring to? After completing the green, red, green, red combination as shown in the picture two, I don’t understanding what to do? OK so I tried step 1 but my Rubik’s cube ended up in my wall. Should I turn it clockwise, counterclockwise, turn my room, or just screw it? You know you are starting with a very specific scenario in which all the things are in a fixed position. I can complete one side of the cube, i.e. one color at a time but no more than dat. Any advice for me, if you would please…..
i should follow the column? or the row??? Wow!! THIS IS FUN !!! If i use the before ex 2 can i use that same beginning for all the other sides? What does repeating this step for all four sides mean? Do I keep Green on top and rotate the whole cube around the Green-Blue axis (Green on top and Blue on ther bottom, and bring the next side (Yellow) to where the Red was and Orange to where the Yellow was and keep repeating this for all sides? What should it look like after the first of 4 sides or are there too many combinations? You need to do each step four times!!!! how do you rotate the middle of a rubiks cube? When it says ” green under” or “red under” does it mean in a specific order or just any where under? what happens if you dont have that. This step, along with the next step, are the most difficult to teach because there are so many possible starting situations. Luckily, after these steps it takes very little effort to solve the rest of the cube, so please be patient on steps one and two. In this step, it is important to remember that the very center piece of each side of the cube doesn’t move, making it that side’s respective color. You must bring all of the other pieces with that color to that side. In the example below we bring the red/green piece to match with the red and green sides. Below are the most common moves for this step. If your cube doesn’t match any of the three starting positions shown below you may need to move some pieces around to get there. You must do this on four sides in order to make a cross like the “after” picture below. So in the example below, I would first get the red/green block in the correct spot (as shown in the “after” picture) then do the yellow piece, then blue, then white. 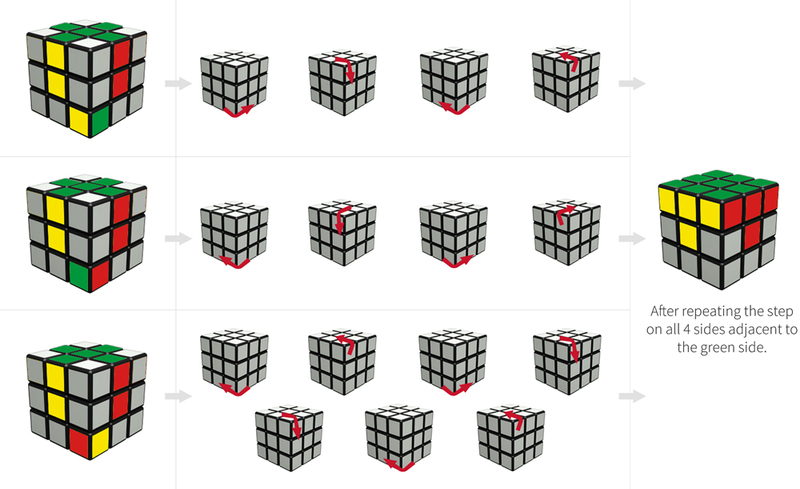 This is how the Rubik's Cube should look when you start this step. 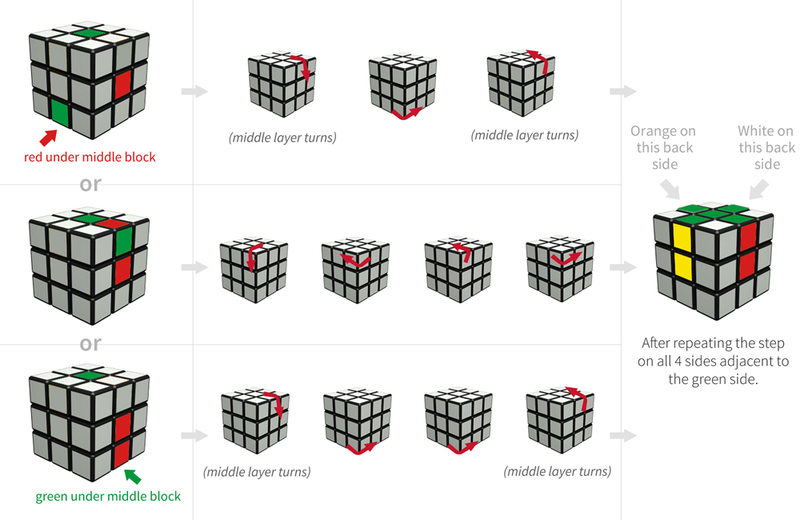 These are the moves that you should make with the Rubik's Cube. This is how the Rubik's Cube should look when you finish this step. Hard Medium Easy How difficult was this step? Not very helpful A little helpful Very helpful How helpful was this video? For the last “starting picture” example, do I read the diagrams straight across or diagonally? It’s a little confusing. @Garret: I can see how this could be confusing. You read the top row first from left to right, then the bottom row. After I do these steps I have the green side completed but the red and yellow don’t make that T shape. How do i do that? I have the ”T” problem as well please help….. I follow these steps, get to 6 blocks filled of the green and then it seems to take me back to the beginning. What am i doing wrong? I get the same problem help! I have 2 Ts done and the other 2 are just missing one spot. The top is green but not in 1 spot and that final green one is not on the bottom row, but on the top one DIRECTLY under the spot it needs to go. so none of the 3 options given apply.. is there anyway to get the green on the bottom or would that just mess everything up? I tried this move a few times, and it has worked almost completely, but it always leaves the bottom left square different on all sides. Help? I am able to completely finish one of the sides bot I cannot make the T’s on the other sides. How am I supposed to make the T’s? Does anyone still need help? What do I do if the corner pieces match up with the color of the side they’re on? I have the one white side done. However I do not have any T’s to speak of… Please help with getting the T’s please. I am also having the “T” problem. I’ve have changed my cube so that the red is where the green is supposed to be and have completed the side but i cant get the t’s to show HELP! Do I have to make the “T” that’s showin in yellow and red in the picture? how does the last step help you solve for the “after” picture? What do you do if the yellow and red block, like in the third picture is up at the top with the green plus, and not on the bottom? I can’t seem to be able to get the first step correct. I’ve tried starting the cube according to each option above, but when I finish not all the cross is completed. If anyone here has completed step one, please help me out!!! It’s at times like this i wish i were einstein…..
Yeah i have a problem, but i’m pretty close to the final result of this step. At the top my cube is missing all but one pice. On the sides, i’ve completeted 3 out of the 4 T’s. The last T i have to make is only 1 cube from being complete. However,there are no red cubes on the bottom row, so i’m kind of stuck. How do you get the “before’ picture? what do u mean when u say all four sides?! its really confusing! help!! For having ‘T’, adjust a green side such that each vertical side color should be equal to the color of the center piece. Here, all greens with vertical yellow side should be in a group. What does all for sides mean if a cube has 6 sides? Well, i could decipher this to an extent. step 2, has 3 scenarios presented. Take for example the first of the three rows, try to get your piece(green) to the position in the bottom layer as depicted in the diagram, then do the 4 moves in row 1 as shown. similarly, get your piece(green) to the position in the bottom layer as depicted by diagram in row 2, then perform the 4 moves in row 2 as shown. What does it mean by all four sides? A cube has six sides! Again, this step is a little harder to teach than the steps to follow because of the amount of possible starting situations, but the pictures below should help you through it. Find a corner piece on the bottom layer that belongs on the top. In our example pictures this is any corner piece with green in it. Move this piece until it is situated on the bottom layer directly below its appropriate place in the top layer of the cube. In other words, the spot where the piece should start out should be in the same column as the spot where you want the piece to end up. Then, refer to the pictures below to solve. Make sure you are looking at the correct starting picture. Do this step to all four corner pieces. I’m following every step and it’s not working. Are other people having this same problem? It’s not working for me, either. I get all but one block on each side. I just reviewed this step and it seems to work fine for me. Give it another try. If you get stuck again try including a link to a picture of your cube. Works fine here. If you have a block in the wrong rotation but correct spot, use this pattern to rotate it out and then use it again to place it back in place, in the right rotation. i cant wait to complete my lego rubix cube solver! these steps don’t seem to be working for me! can I get some help? I’m getting every block except for the corner one! is this right? works for me. try repeating the step on the same side until you get it right. Try reversing the direction and order of the steps for the corner you’re stuck on. I had the same issue and this worked for me. I encountered problems at first as well because I wasn’t sure if the color of the tile at the bottom of “T” (top surface of the cube in the picture) mattered. Then I studied the pictures again and realized that not only must the “T” be created, but the color of the tile at the bottom of the “T” (on the top surface, surrounded by “white” tiles in the picture) must correspond with the color of the bottom line to the left (or right, depending on what works with your particular combination) of your “T”. Once that was cleared up in my mind, the moves went very smoothly. I can get it as long as they match the pictures, but I get stuck if I don’t have a match. So when I do it in reverse it messes everything up. Could you explain that better? I am stuck on this step, I can get the bottom 2 rows on the yellow side but when I try the first step to get the red it just screws up my yellow…can anyone help? I can’t get it to work. I can get most of them but then I get stuck on the last 2 colors. They don’t match up like they’re supposed to. I got it working just fine people. If it isn’t working for you just do the step, then when you are done just do it for the next side until you have done it for all four sides. What about the corners? I have two orange corners at opposite ends. My underside is green and the two oranges sit on the blue side…. What exactly does it mean to “do one of the moves below in reverse”? Do you start with the last step and do each step backwards? Do you start with the last step and do each step as shown? Do you start with the first step and do each step backwards? What does it mean by “do one of the steps below in reverse” how do i do a step in reverse? I’m having the same problem. Its just one, and no matter what i do its the same thing. – This doesn’t seem to apply, or not in every case. Not in my case. The “before” picture cannot be matched by simply turning the top layer of the cube. For those having trouble: If your cube looks like the top cube, then ONLY follow the first two lines of moves. If it looks like the bottom cube then ONLY do the last two lines of moves. This made it work for me, as I was trying to use all four lines of moves. I get going pretty well, with white on the bottom and yellow on the top, however I get to a point in this step when all the edges on the side are yellow, and I don’t know how to fix it. help would be appreciated. Help! Whenever I do this step, i don’t end up with 6 complete on each side, as in the picture, i end up with weird blobs of more than 6 which are not arranged neatly… why? Ok, now i have fixed it… almost. it’s all evenly 6, except there is one block in the middle layer, an edge block, and each side of it is on the wrong side… how can i flip this block? For this step, if anyone is having problems with it…. I had to try it a few times to get it. Look at the “before” picture and get colors that correspond with the way it’s set up. Choose the picture that matches your scenario and follow the steps. You should get the bottom two layers filled on one side. Once you get that, turn the whole cube around 90 degrees, MAKE SURE IT CORRESPONDS with the “before” picture again, then follow the steps again that correspond with the situation you have on your cube. That might be the biggest mistake people were making. Hope this helps. When i do this step, i get the middle layer correct but the face i completed in step one is now screwed up. I get all blocks on one side but I cant get that figure I need. When you say one of the moves in reverse, does that mean do one of the steps backwards, or do you mean to do the opposite of every step? If you get all the middle row except one cube, do one rotation for either of that side and it should get you back to the last upside down “T” you need. I’m having trouble with this step. I was able to figure out the first two, but this third one really messed me up. It’s rotate top counter clock wise, rotate left up, rotate top clock wise, rotate left down, rotate top counter clock wise, rotate front clock wise, rotate top counter clock wise, rotate front counter clock? All of these rotations are only done once? It’s wonderful! I’ve got the whole cube working! I have been cubing for almost two years now. This algorithm works. Maybe looking at standard notation may help, The top algorithm is: U’ F’ U F U R U’ R’, and the bottom algotrithm is: U R U’ R’ U’ F’ U F.
Also make certain that the edge you are trying to move to the middle layer is in the proper location as shown in the images on the left. The “Hint” does not make sense to me. Could someone please further explain how one goes about doing one of these moves in “reverse” ?? Please Help!!! After doing this step once, twist the top row until the two sides of the cube with 5 of the 6 bottom squares correct matches the diagram,and do this step again. People keep asking what doing the move ‘in reverse’ means, and there’s still no explanation. Can someone please clarify this? What if i can’t match one of the before pics? Here is only two types. There is an other chance. Admin please publish that one also..
OK, here is my problem. You know how you are suppose to have the color that you want in a specific place at the top in order for you to have all matching colors in the middle, well in my case I have all of the colors except one blue. Now the blue is on top of the all the other blues like an upside down T, how do I get the blue on the top face(U) without messing anything else up?????? how do i get all the blues on top? I have the same problem, when im trying to make the last middle blue cube to go on the bottom it wont go and just stays in the same place. Just keep repeating the same movement again and again until u get it right! I had the same problem. It worked for the first two, but not for the second two. Then, as suggested by Barney, I believe, I kept doing it some more. After like 4 or 5 times, they both went at once. Weird. I too am stuck on this step. I’ve gotten to three parts of the cross and then even after 20 more goes, I still can’t get the last piece to go to the right place. Yep, me, too. Getting stuck on this step – doing the moves over and over just moves the blue pieces around the top deck. I seem to be having the same problems. The blue price moves but it never goes to the top. I just can’t get past this step. I have the same problem as everyone else. Three of my blue pieces fit together, but the last one won’t work. I am stuck every time I go to put the last square on top I simply knock another off. Can anyone help me out? i have 2 of the blue pieces in the right places but the other two are switched what in the world do i do? Yes – I don’t think this works either. The last piece nevers comes to the top – just keep rotating that piece but always ending up with blue face pointing left, not upwards. Yes, i made it thanks to this site! In this step, the goal is to get the top face of the cube to have a cross. In the “after” picture below this is the blue side. You start out by facing a side of the cube that has a blue piece (or whatever your top color is) in the top layer in the front left position (refer to the “before” picture below). It‘s okay to have a blue piece in the front right position as well, but the key is to make sure that there is a blue piece on that front left side. You then follow the moves in the pictures below. Just doing this step once most likely won’t be enough. You may have to repeat the step a few times until there is a cross. You will also likely have to rotate the cube in your hands to manipulate different sides (still make sure a blue piece is in the front left position!). Wow by accident, with this step I COMPLETED THE CUBEE! thankszzzzz ssOOOOOOo much!!!!!!!!!! <3 this site!!! This site helps a lot a lot more than YouTube video but I’m sort of stuck. I keep doing that step, and correctly, but all four sides just wont get the middle piece. Is this step correct? Tried it numerous times. to me, i find it confusing. Also stuck here. What do you mean exactly by, “when you have two adjacent sides in correct place”? Try doing this move backwards. Instead go down, right, up, right, down, right, right, and up. I did have some problems with this step but then realized what I could do to fix it. To anyone reading this note, if you repeat step 5 two times, you should have two of the top middle pieces in place. The other two sides should be back to front. TO COMPLETE WITH THIS ARRANGEMENT: Twist the top row ONCE to the left, and repeat the step. This should complete this step. And yes, random guy possibly below me, I have also completed the cube on this one step. See ya! add a U to the end of the algorithm. did it! thanks to Rame i think i got it! thankz Rame. I did this step once and it worked, but the next time I was trying to do this step it wouldn’t work. I did it multiple times but it still didn’t line up. What do you mean by ‘adjacent sides’? I had trouble with this step too. after doing this move once, the front left cube stays in place, while the other three rotate places in an anticlockwise fashion. So front right moves to back right, back right moves to back left, and back left moves to front right. Thanks to solver and all friends who give important notes. About half the time I try this step it totally messes up the cube. Am I doing something wrong or should not be following the step exactly or something? I had a bit of trouble with this step too, until I realized I was skipping an important part: when NONE of the sides match, turn the top until one does. It’s legal; you won’t mess anything up. Also, the move for this step merely swaps three of the corner pieces in a counter-clockwise fashion, namely the front-right to the back-right to the back-left and to the front-right again. Orienting the pieces properly will fix it easily. Okay after many times doing this step I got the top to be all full yet the sides were not. I got it!!! Just wish I knew what to do next. This only works a little. I can only get this to work for two sides at a time. It’s annoying because sometimes you have to do it fifty times. Thanks verry much misterX! I have it now. right down, top right, right up, top right, right down, top right, top right, right up, right up, top left, right down, top left, right up, top left, top left, right down, top left. The beginning picture has it opposite. If you do it with the correct side on the right, instead of the left, then all four sides will get it in one try. This site helped me a lot! I finally solved the cube! These steps are very easy to understand. Awesome job. the middle pieces fall in the right place but then the corner pieces are always stuffed up :/ does this move also solve the corners or only the middle..
We take security seriously. We use a secure connection and collect payments using Stripe, an industry-leading payment gateway. After you submit the payment you will be able to login here (or at the top of the website) using your email address and see the remaining two steps. You will also receive an email from us with a link to download the E-Book. I already purchased. Log me in! Enter your email address associated with your payment (PayPal email) to login. Rubik's Cube® used by permission of Seven Towns Ltd. Copyright RubiksSolver.com. All right reserved.